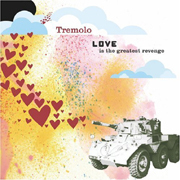 With nary a jagged edge or loud guitar that isn't mixed down, Tremolo is a band that fits perfectly in with the adult alternative crowd. The songs are well produced, the music nearly flawless, and the hooks plentiful. It's safe, bland, and inoffensive. But, in that is where the beauty lies, pretty pop songs that get you singing along. This is a record that, if you give it a chance, you'll really start to enjoy - and so will your mother and grandmother. It's that pretty and polished. I'll give it a C+.